Leading supplier of innovative online gaming software, Playtech, recently announced the release of their latest slot titled New Hologram Wild. This most recent release from Playtech will transport you into a galactic excursion with its 'Hologram Wilds.' This ground-breaking online slot features with holographic reels and showcases an array of traditional fruit symbols that has a real sci-fi ambience to it. The new Hologram Wilds slot is available to play on laptops, PCs, Android and iOS amongst others platforms. For a limited duration punters can grab hold of the Playtech no deposit bonus at all participating Playtech casino's. For more information on this slot game, continue reading. Playable from just 40 p per spin the New Hologram Wild slot features with 5 reels and 40 paylines and comes with a lot of notable attributes that include Stacked Wilds on all the reels and a Free Spins Round with added Wilds. Furthermore, one of the interesting features about this slot is the fact that the reels spin from the bottom upward, instigating the symbols to head heavenwards. The five reels of new Hologram Wilds slot are occupied with fruit and 7's also known as old school fruit machine symbols but, simultaneously, the graphics - including the holographic effect on each reel - are innovative. Icons include apples and pineapples, cherries and lemons, bananas and plums and blueberries and melons. The lucky 7 is the pick of the bunch of these standard symbols and rewards punters with up to 30, 100 or 400 coins if they land 3, 4 or 5 on a pay line. The Hologram Wild resembles the Wild symbol and can settle on all 5 reels and substitute all other symbols with the exception of the Golden Crown Scatter. Securing 3, 4 or 5 Wilds in a combination awards a payout of 50, 200 or 1,000 coins. The key enticement in New Hologram Wilds Slot is the Free Games attribute where you will start with 5 free spins. Watch out for 3 or more scatters though as these will reward you with an extra 5 free spins. You can reactivate the feature limitless times to give you an unrestricted total of free spins. Moreover, you will also profit from heaps of holograms wilds in the course of the feature to boost your winning potential. As a recommended online betting review site we encourage you to check out Vegas Red Bonus Casino, the number one choice for real Canadian poker punters. Receive a $10 No Deposit Bonus to check out the New Hologram Wilds slot. If you like what this site has to offer you, download the software, and receive a warm welcome bonus to use on your first deposit. When you make your first deposit at Vegas Red, you will automatically be credited a 100% return on your deposit, up to $200. In other words, if you deposit $50, you'll have $100 to play with immediately. Be sure to keep an eye on the promotions page of the website so you don't miss out. 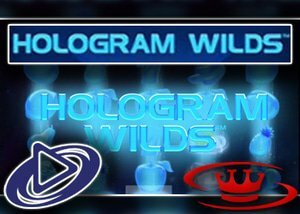 If you want to play the New Hologram Wilds slot from Playtech why not visit Vegas Red Bonus Casino today.